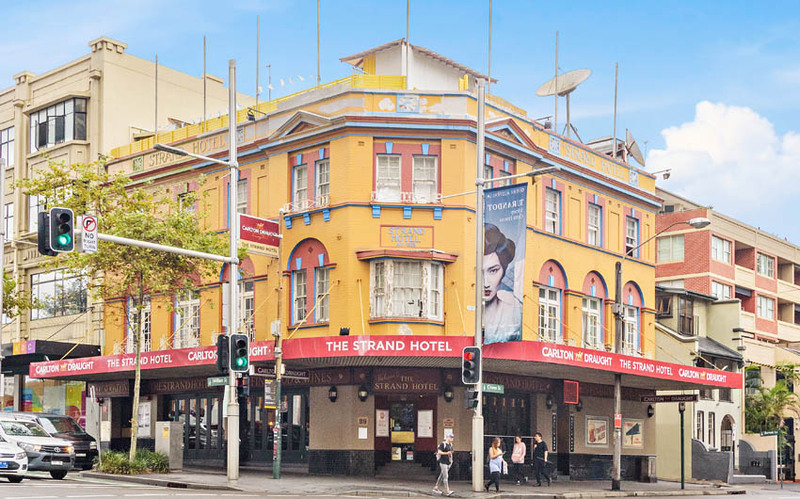 Rare vendors Bill and Mario Gravanis have decided to list their freehold going concern of the Strand Hotel Darlinghurst, to focus on recent acquisitions. Oscars Hotels operates 26 venues, making it one of the country’s largest privately-held groups, and one of the most diverse, encompassing f&b, gaming and accommodation, plus retail, conferencing and chartered vessels. The Gravanis brothers have been particularly acquisitive in the past two years, quietly taking on the Botany Bay Hotel, Feros’ big Rocksia Hotel, Redcape’s Livingstone Hotel, and popular Wollongong drinking hole the Cringila Hotel. The four-level Strand Hotel features a 24-hour liquor licence, gaming room with 20 machines and 3-hour weekend shutdown, and 23 accommodations rooms set up to provide 87 beds. Located in a ‘green’ zone, it could have up to 30 EGMs. Set on a 279sqm corner site with triple street frontage, the property is zoned B4 Mixed, with 22-metre height approval and healthy 4:1 FSR. The pub reports annual revenue north of $2.8 million, and is currently ranked #513 on Liquor & Gaming’s NSW venues list. Not typically sellers of assets, the brothers cite ‘portfolio hygiene’ and some operational consolidation for the sale, engaging HTL Property’s Dan Dragicevich, Sam Handy and Andrew Jolliffe to market the asset and opportunity. “The Strand is a very rare city fringe freehold exhibiting all the key fundamentals astute purchasers search for in hotel opportunities – arterial, corner junction positioning, late-trading flexibility, as well as substantial accommodation and gaming inventory,” notes Dragicevich. While no price indication has been provided for the Strand, its attributes put it in line with the likes of the nearby Bells Hotel, which Arthur Laundy bought in November for around $15 million, or the Coopers Hotel in Newtown, which King Tide group grabbed in February for $13.5 million. HTL Property report market and lender interest in hotel assets continues to put downward pressure on yields, and sees market activity continuing through 2019. “We expect strong interest from a range of hospitality operational profiles and land bankers alike,” added Dragicevich. The Strand Hotel is for sale via a national Expressions of Interest campaign, closing Thursday, 11 April.